^ Born on 22 March 1875: Richard Emil Miller (aka Richard Émile Miller; Richard Edward Miller), US Impressionist painter who died in 1943. — Miller began studying art in his hometown, St. Louis; but in 1898, like many US artists of the late nineteenth century, he sought the prestige of study in Paris. Unlike most of his compatriots abroad, however, he remained in France for 16 years. He became a leading member of the Giverny Group, a circle of US Impressionist painters who worked in the French countryside near the village of Giverny in the 1880s. US painters were attracted to the area because of the presence of French Impressionist Claude Monet [14 Nov 1840 – 05 Dec 1926] and his famous garden. Their most typical subject was women in vibrant, sun-filled landscapes surrounded by an abundance of flowers and foliage. Miller's paintings are typically show women in gardens or seated at a table in a room open to a garden. At the outbreak of the First World War Miller left France for Pasadena, California. His work contitued to be characterized by a sentimental and decorative impressionism that he carried into the 1930s.  His students included Frederic Milton Grant. — Reflections (1910, 36x36 in. ; 393x395pix, 139kb gif) _ Reflections is typical of the fin-de-siecle paintings of beautiful women daydreaming within elegant domestic interiors. It bears remarkable resemblance to a contemporary painting by Robert Reid: The Violet Kimono (1910; 600x528pix, 95kb). In both paintings a young woman lounges at her dressing table attentive to flowers in a vase, her face reflected in her mirror. Reflections is very characteristic of Miller's style. Typical of his pictorial devices is the backlighting of bright sunlight entering in through the window. The work also reveals Miller's tendency for geometric linearity, as shown in the lines of the mirror, table, window shades, and chair rungs. The woman's form is more strongly delineated and less fragmented than many of those by his fellow impressionists. His palette is also brighter and here shows his affnity for greens and purples. The title is vague. Does it indicate the woman's contemplative posture and/or the reflective nature of the mirror? Her seeming listlessness suggests the latter. She is compressed into a pictorial space that creates a sense of confnement and limitation. The lack of extraneous space also heightens her potential for objectification. With eyes downcast and slumped in a state of inertia, she reminds us of the model in The Spinner (1880, 107x137cm; 387x500pix, 139kb gif) by Thomas Dewing [1851-1938]. The fact that the woman in Reflections neither confronts the viewer with her gaze nor contemplates herself in the mirror robs her of self-identity; she remains offered for our sight and not her own. Unlike the modest old-fashioned dress of Dewing's model, Miller's subject is sensuously dressed in a loose-fitting robe that has fallen off one shoulder. The kimonolike robe with its bright colors was a favorite decorative device used by Whistler and other artists caught in the craze of orientalism in the later nineteenth century. Of much older pictorial tradition is the inclusion in a female portrait of the mirror and flowers, connotations of vanity and femininity. _ Knock, Turn, and Run aka Tune Nut (2006; screen filling, 267kb _ ZOOM to 932x1318pix, 846kb).  He was the brother-in-law of Anton von Maron. Mengs's students included JFA Tischbein, Peder Als, Richard Brompton and Giacomo Quarenghi [Venetian Architect, 1744-1817].  Mengs was perhaps the leading artist of early Neoclassicism. Mengs studied under his father in Dresden, Saxony, and then in Rome. He became painter to the Saxon court in Dresden in 1745 and executed a large number of portraits, most in brightly colored pastels. Mengs returned to Rome in the early 1750s, and about 1755 he became a close friend of the German archaeologist and art critic J.J. Winckelmann. He came to share Winckelmann's enthusiasm for classical antiquity, and upon its completion in 1761 his fresco Parnassus at the Villa Albani in Rome created a sensation and helped establish the ascendancy of Neoclassical painting. Mengs also continued to paint portraits during this period, competing with Pompeo Batoni, the leading Rococo portraitist of the Roman school. In 1761 he went to the Spanish court at Madrid, where he worked on the decoration of royal palaces. From 1769 to 1772 Mengs was in Rome, decorating the Camera dei Papiri in the Vatican, and he returned to Spain from 1773 to 1777. Mengs was widely regarded in his day as Europe's greatest living painter. He eschewed the dramatic illusionism and dynamism of the Baroque style in his figural compositions, preferring instead to blend quotations from ancient sculptures with stylistic elements of Raphael, Correggio, and Titian. The results are generally cold, insipid, and contrived, however, and Mengs's reputation has declined precipitously since the 18th century. Some of his portraits display a freedom and sureness of touch entirely lacking in his more ambitious works. Mengs's treatise Reflections on Beauty and Taste in Painting (1762) was also influential in his day.  Mengs was born in Aussig, Bohemia, into an artistic family of German origin. Soon after his birth his parents returned to Saxony. Anton received his earliest training from his father in Dresden and in Rome, where he studied Italian Renaissance painters and worked in the studio of Marco Benefial. When he came back to Dresden in 1745, he became a painter to the Saxon court of Elector Augustus III, who was at the same time the King of Poland. Mengs executed for the court a large number of portraits. In the early 1750s, Mengs again left for Rome. About 1755, he became a close friend of the German archaeologist and art critic J. J. Winckelmann, the author of the famous A History of Ancient Art (1764). Mengs came to share Winckelmann's enthusiasm for classical antiquity, and worked to establish the dominance of Neoclassical painting. At the same time the influence of the Roman Baroque remained strong, particularly in his religious paintings. In Italy Mengs was commissioned to paint a series of portraits for Augustus III�s son-in-law, Charles VII, King of Naples. In October 1759, Charles VII inherited the Spanish Crown as Charles III and, as his court painter, Mengs spent several years (1761-1769) in Madrid, painting decorations in the Royal Palace and portraying the important persons belonging to the court. From 1769 to 1772, Mengs worked in Rome, decorating the Camera dei Papiri in the Vatican, and he returned to Spain from 1773 to 1777. Mengs was widely regarded in his day as Europe's greatest living painter. Although he died at the early age of fifty (1779) he had a profound influence not only on his native contemporaries but also on Roman, French and Spanish artists. Mengs's treatise Reflections on Beauty and Taste in Painting (1762) was also influential in his day. Mengs died in Rome. 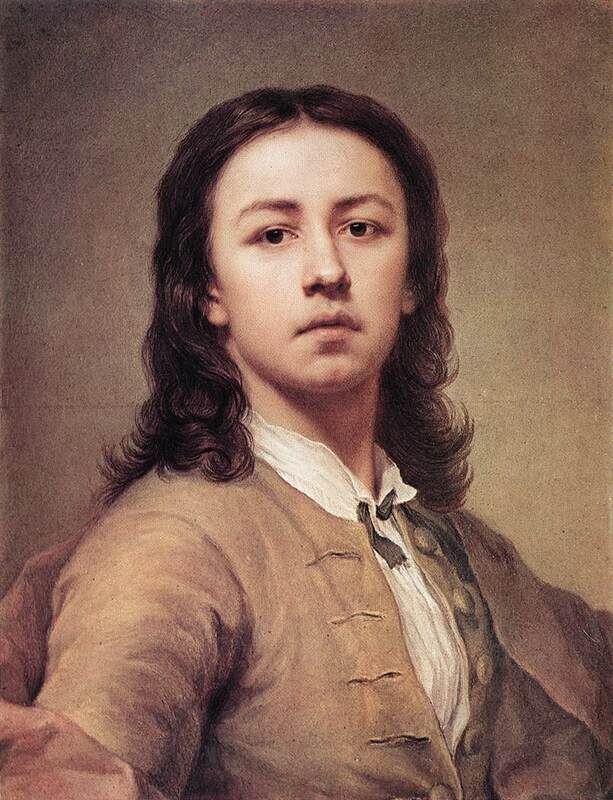  Self-Portrait _ Self-Portrait (2 sites for the same, 1744, 55x42cm) _ This self-portrait, showing the influence of Venetian painting, was made by the young artist at the age of 16.  Self-Portrait _ Self-Portrait _ Self-Portrait (3 sites for the same, 1779, 56x43cm).  Ferdinand IV, King of Naples (1760, 179x130cm) _ Mengs spent his last 15 years in Spain where he became the favorite painter of King Charles III. The king commissioned the artist to paint the frescoes of the new Royal Palace and to portray the important persons belonging to the Court. Ferdinand I (1751-1825) king of the Two Sicilies (1816-1825) who earlier (1759-1806), as Ferdinand IV of Naples, led his kingdom in its fight against the French Revolution and its liberal ideas. A relatively weak and somewhat inept ruler, he was greatly influenced by his wife, Maria Carolina of Austria, who furthered the policy of her favorite adviser, the Englishman Sir John Acton. 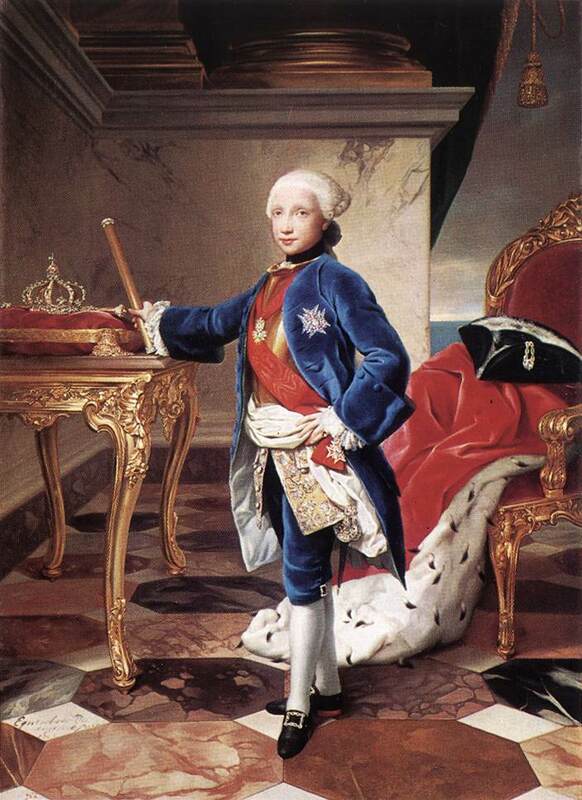 Ferdinand became king of Naples as a boy when his father ascended the Spanish throne (1759) as Charles III. A regency ruled during Ferdinand's minority and continued the liberal reforms of the previous king. 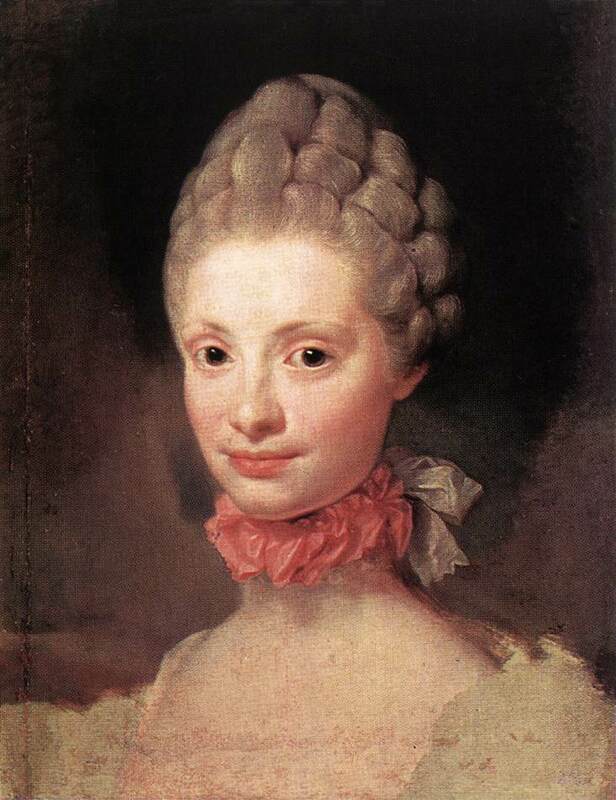 In 1767 Ferdinand reached his majority, and his marriage in 1768 to Maria Carolina signalled a reversal of this policy. The birth of a male heir gave Maria Carolina the right, according to the marriage contract, to enter the council of state (1777). She brought about the downfall of the former regent Bernardo Tanucci and engaged Naples in the Austro-English coalition against the French Revolution in 1793. Ferdinand, encouraged by the arrival of the British fleet of Admiral Horatio Nelson, attacked the French-supported Roman republic in 1798. On 21 December of that year, however, the French invaded Naples, declaring it the Parthenopean Republic, and Ferdinand fled to Sicily. The Republic was overthrown in June 1799, and Ferdinand returned to Naples, where he put to death the Republic's supporters, violating the terms of their surrender. In 1806 Napoléon's army captured Naples, forcing Ferdinand's flight to Sicily, where, yielding to British pressure to mitigate his absolutist rule, he removed Maria Carolina from the court, appointed his son Francis as regent, and granted the Sicilians a constitution. With the fall of Napoléon, he returned to Naples as Ferdinand I of the united kingdom of the Two Sicilies (December 1816). His renewal of absolute rule led to the constitutionalist uprising of 1820, which forced Ferdinand to grant a constitution. Having ceded power again to his son Francis, Ferdinand, under the pretext of protecting the new constitution, obtained his parliament's permission to attend the Congress of Laibach early in 1821. Once there, he won the aid of Austria, which overthrew Naples' constitutional government in March. The subsequent reprisals against the constitutionalists were his last important official acts before his sudden death.  Maria Luisa of Parma (1765, 48x38cm) _ Maria Luisa of Parma was the wife of Charles IV, king of Spain (1788-1808) during the turbulent period of the French Revolution. Lacking qualities of leadership himself, Charles entrusted the government (1792) to Manuel de Godoy, a prot�g� (and lover) of the queen, Maria Luisa. The unfinished painting, showing the young princess at the age of 15, is a study, the final painting is in the Metropolitan Museum of Art in New York. 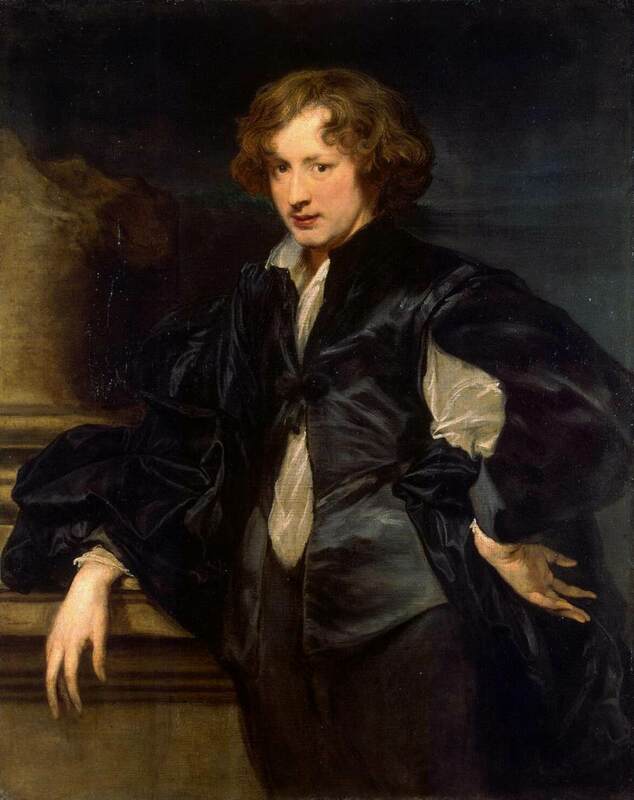 ^ Born on 22 March 1599: Anthony van Dyck, Flemish painter, draftsman, and printmaker, specialized in portraits, active also in Italy and England, who died on 09 December 1641. — He was the leading Flemish painter after Rubens in the first half of the 17th century and in the 18th century was often considered no less than his match. A number of van Dyck�s studies in oil of characterful heads were included in Rubens�s estate inventory in 1640, where they were distinguished neither in quality nor in purpose from those stocked by the older master. Although frustrated as a designer of tapestry and, with an almost solitary exception, as a deviser of palatial decoration, van Dyck succeeded brilliantly as an etcher. He was also skilled at organizing reproductive engravers in Antwerp to publish his works, in particular The Iconography (1632�1644), comprising scores of contemporary etched and engraved portraits, eventually numbering 100, by which election he revived the Renaissance tradition of promoting images of uomini illustri. His fame as a portrait painter in the cities of the southern Netherlands, as well as in London, Genoa, Rome and Palermo, has never been outshone; and from at least the early 18th century his full-length portraits were especially prized in Genoese, British and Flemish houses, where they were appreciated as much for their own sake as for the identities and families of the sitters.  Student of Peter Paul Rubens. Painted in Italy, England and Antwerp. The records of the Antwerp Guild of Saint Luke first mention Anthony van Dyck, who was born in that city, as an apprentice of Hendrick van Balen in 1609. By 1618 Van Dyck was received as an independent master by the guild. Prior to that time he had established contact with the older Rubens. The scanty contemporary evidence suggests a changing collaborative relationship between the two artists, as Van Dyck would move from the position of a gifted apprentice to that of the most important member of Rubens's large studio. In the fall of 1620 Van Dyck is first recorded in England, at the court of James 1. Returning briefly to Antwerp in 1624, Van Dyck then traveled to Italy, visiting Genoa, Venice, Florence, Rome, and Palermo, before arriving back in Antwerp by the beginning of 1628. The effect of Venetian colorism, particularly as seen in the works of Titian, reinforced lessons learned from Rubens; Van Dyck remained a brilliant colorist throughout his career. Working in Antwerp until 1632, Van Dyck then returned to England at the invitation of Charles 1, who knighted him that year. Broken only by brief visits to the Continent, Van Dyck would spend the rest of his life in England, where he died at the age of forty-two. An accomplished history painter, Van Dyck is best known today as a portraitist. In addition to his consummate technical skill, Van Dyck's ability to capture the facial features of his portrait subjects and to characterize their social status soon made him much sought after by Europe's nobility and aristocracy. His portraits of the first Genoese period and later, which were initially based on the Italian portraits of Rubens, created the vocabulary of aristocratic portraiture that remained preeminent until the nineteenth century and that helped to shape England's great portrait tradition.  Sir Anthony van Dyck was a Flemish painter who was one of the most important and prolific portraitists of the 17th century. He is also considered to be one of the most brilliant colorists in the history of art. Van Dyck was born in Antwerp, son of a rich silk merchant, and his precocious artistic talent was already obvious at age 11, when he was apprenticed to the Flemish historical painter Hendrik van Balen. He was admitted to the Antwerp guild of painters in 1618, before his 19th birthday. He spent the next two years as a member of the workshop of the Flemish painter Peter Paul Rubens in Antwerp. Van Dyck's work during this period is in the lush, exuberant style of Rubens, and several paintings attributed to Rubens have since been ascribed to van Dyck. From 1620 to 1627 van Dyck traveled in Italy, where he was in great demand as a portraitist and where he developed his maturing style. He toned down the Flemish robustness of his early work to concentrate on a more dignified, elegant manner. In his portraits of Italian aristocrats�men on prancing horses, ladies in black gowns�he created idealized figures with proud, erect stances, slender figures, and the famous expressive �van Dyck� hands. Influenced by the great Venetian painters Titian, Paolo Veronese, and Giovanni Bellini, he adopted colors of great richness and jewel-like purity. No other painter of the age surpassed van Dyck at portraying the shimmering whites of satin, the smooth blues of silk, or the rich crimsons of velvet. He was the quintessential painter of aristocracy, and was particularly successful in Genoa. There he showed himself capable of creating brilliantly accurate likenesses of his subjects, while he also developed a repertoire of portrait types that served him well in his later work at the court of Charles I of England. Back in Antwerp from 1627 to 1632, van Dyck worked as a portraitist and a painter of church pictures. In 1632 he settled in London as chief court painter to King Charles I, who knighted him shortly after his arrival. Van Dyck painted most of the English aristocracy of the time, and his style became lighter and more luminous, with thinner paint and more sparkling highlights in gold and silver. At the same time, his portraits occasionally showed a certain hastiness or superficiality as he hurried to satisfy his flood of commissions. In 1635 van Dyck painted his masterpiece, Charles I in Hunting Dress, a standing figure emphasizing the haughty grace of the monarch. Van Dyck was one of the most influential 17th-century painters. He set a new style for Flemish art and founded the English school of painting; the portraitists Sir Joshua Reynolds and Thomas Gainsborough of that school were his artistic heirs. He died in London.  Anthony van Dyck (Antonie or Antoon van Dijck) is one of the greatest Flemish painters. He was born in Antwerp, 7th child in the family of a well-to-do silk merchant Frans van Dyck. After the early death of his mother he, at the age of 10, was sent to be trained by painter Hendrick van Balen in his workshop. In 1615, he already had his own workshop and an apprentice. In 1618, he was accepted as a full member of the Lucas Guild of painters. 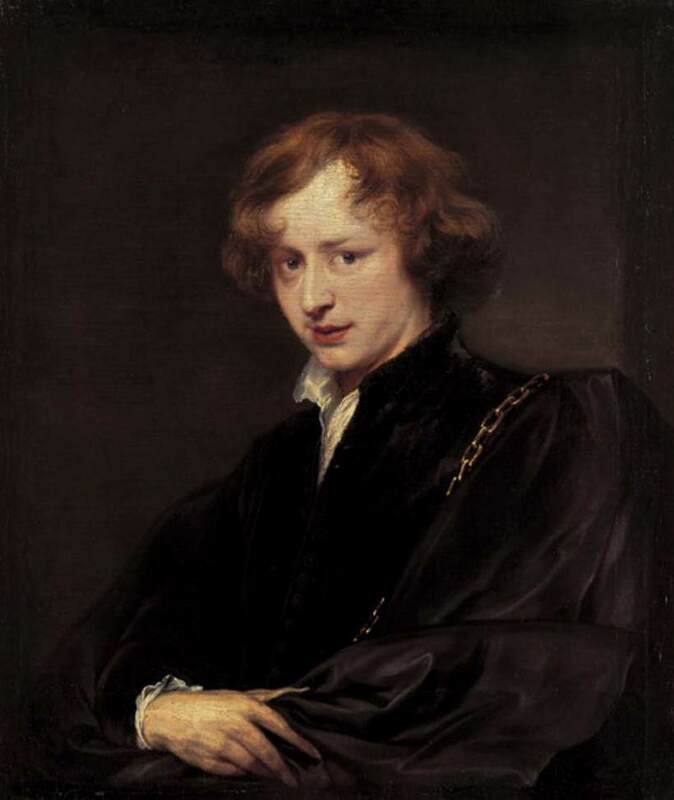 In 1618-1620, Van Dyck was working with Rubens as his student and assistant. He took part in the painting of the Jesuit Church in Antwerp. Also he painted such religious works as Samson and Delilah (1620), The Crowning with Thorns (1620), Judas' Kiss (1618-1620), St. Martin Dividing His Cloak (1620-1621) and portraits: Frans Snyders (1618), Margareta de Vos (1618), Family Portrait (1621) and several known self-portraits. Although Van Dyck was with Rubens little more than two years, the older master's style affected his own indelibly. By his twenty-first year Van Dyck was already ripe for independence. His pride and ambition made it hard for him to stand in Rubens' shadow in Antwerp. He therefore accepted the invitation from Earl of Arundel to London, where he stayed several months. In England he painted Thomas Howard, 2nd Earl of Arundel (1620-1621) and other pictures. Also he was able to study the numerous works of the masters of Italian Renaissance, which were in the collections of the Earl of Arundel and the Duke of Buckingham. This led him to follow in the footsteps of his teachers Van Balen and Rubens and finish his education in Italy. Van Dyck left London in February 1621 and after staying 8 months in Antwerp, he arrived in Italy by the end of 1621. He spent 6 years in Italy, staying mostly in Genoa and traveling to Rome, Venice, Turin and Palermo, studying and copying the Venetian masters, Tintoretto, Veronese, and particularly Titian, whose works influenced him greatly. He earned his livelihood by creating portraits especially of the Genoese aristocracy. The most notable portraits were George Gage, Looking at a Statuette (1623), Cardinal Bentivolo (1622-1623), Lucas van Uffeln (1622), Elena Grimaldi, Marchesa Cattaneo (1623), Paola Adorno, Marchesa Brinole-Sale with Her Son (1626), Giovanni Vincenzo Imperiale (1626). Also he was commissioned to paint some pictures for the Church Oratorio del Rosario depicting St. Rosalia, the patroness saint of Palermo. Other well-known religious picture of this period are Susanna and the Elders (1621-1622), The Four Ages of Man (1626), The Tribute Money (1620s). In 1627, Van Dyck returned to Antwerp, where he was given a triumphal welcome. He received many commissions for churches and became a court painter to the Archduchess Isabella in 1630. He created an astonishing amount of portraits during his stay in Antwerp in 1627-1632, the best of them are Portrait of Maria Louisa de Tassis (c.1630), Philippe Le Roy (1630), Marie de Raet, Wife of Philippe Le Roy (1631), Prince Rupert von der Pfalz (1631-1632). He also undertook a bigger project Iconography, for which he created the engravings of the famous people of the time: monarchs, commanders, philosophers, artists, collectors. It was published in 1628-1641. In 1632, Charles I invited Van Dyck to England to be a court painter. He was knighted, rewarded with the generous annuity of �200 and lavished with gifts. Sir Anthony van Dyck was crucial to Charles I: his portraits were designed to support the King in his claim to be absolute monarch. Other artists painted Charles, too, but it is Van Dyck's image of this melancholic, doomed King that is remembered in history. Van Dyck painted 37 pictures of Charles I and 35 of his Queen Henrietta Maria. The best of them are Equestrian Portrait of Charles I, King of England with Seignior de St. Antoine (1633), Queen Henrietta Maria with Sir Jeffrey Hudson (1633), Charles I, King of England, at the Hunt (1635) Charles I, King of England (1636), Charles I, King of England, from Three Angles (1636), Children of Charles I (1635), Equestrian Portrait of Charles I, King of England (1638). Van Dyck become a celebrated portraitist of the English court and aristocracy. In less that 10 years he created over 350 pictures, including royal portraits. His best portraits are Philip, Lord Wharton (1632), George Villiers, 2nd Duke of Buckingham and His Brother Lord Francis Villiers (1635), Thomas Howard, 2nd Earl of Arundel and Surrey with His Grandson Lord Maltravers (1635), James Stuart, Duke of Lennox and Richmond (1637), Lord John Stuart and His Brother Lord Bernard Stuart (1637), George Digby, 2nd Earl of Bristol and William Russell, 1st Duke of Bedford (1637), Princess Mary Stuart and Prince William of Orange (1641). In 1639, Van Dyck married Mary Ruthven, grand-daughter of the Earl of Gowrie. His only daughter was born on the 1st of December, 1641 and on the 9th of December, 1641 he died in London. He was buried in the St. Paul Cathedral. In his court portraits Van Dyck established a style of characterization that was to persist all over the Europe for more than two centuries: in his visions of tall and aloof, yet relaxed, elegance, he showed the most subtle ability to bring a precise physical likeness into compositions of fluent and elaborate Baroque splendor. He was in particular a stimulus to English painters, such as Gainsborough, Reynolds and Lawrence. — The records of the Antwerp Guild of Saint Luke first mention Anthony van Dyck, who was born in that city in 1599, as an apprentice of Hendrick van Balen in 1609. By 1618 Van Dyck was received as an independent master by the guild. Prior to that time he had established contact with the older Rubens. The scanty contemporary evidence suggests a changing collaborative relationship between the two artists, as Van Dyck would move from the position of a gifted apprentice to that of the most important member of Rubens's large studio. In the fall of 1620 Van Dyck is first recorded in England, at the court of James I. Returning briefly to Antwerp in 1624, Van Dyck then traveled to Italy, visiting Genoa, Venice, Florence, Rome, and Palermo, before arriving back in Antwerp by the beginning of 1628. The effect of Venetian colorism, particularly as seen in the works of Titian, reinforced lessons learned from Rubens; Van Dyck remained a brilliant colorist throughout his career. Working in Antwerp until 1632, Van Dyck then returned to England at the invitation of Charles 1, who knighted him that year. Broken only by brief visits to the Continent, Van Dyck would spend the rest of his life in England, where he died at the age of forty-two. An accomplished history painter, Van Dyck is best known today as a portraitist. In addition to his consummate technical skill, Van Dyck's ability to capture the facial features of his portrait subjects and to characterize their social status soon made him much sought after by Europe's nobility and aristocracy. His portraits of the first Genoese period and later, which were initially based on the Italian portraits of Rubens, created the vocabulary of aristocratic portraiture that remained preeminent until the nineteenth century and that helped to shape England's great portrait tradition. — The assistants of van Dyck included Adriaen Hanneman, Michel Lasne, Remi van Leemput , Matth�us Merian II, Edward Pierce I. — Giovanni Benedetto Castiglione and Theodore Russell were students of van Dyck.  Self-Portrait (1629, 116x93cm; 994x800pix, 118kb) (3/4~length) _ Self-Portrait (head and shoulders) _ These are two of the three versions of a painting representing the painter at 20, although they were painted later, based on an earlier, now lost, study.  William II, Prince of Orange and Princess Henrietta Mary Stuart, daughter of Charles I of England (1641) _ William II of Orange [27 May 1626 – 06 Nov 1650 Gregorian] and Mary Henrietta Stuart [14 Nov 1631 – 03 Jan 1661 Gregorian] were married on 12 May 1641 (Gregorian) in London. In William succeeded as stadholder of the Netherlands after the death of his father Frederick Henry of Orange [29 Jan 1584 – 14 March 1647 Gregorian]. Both William and Mary died of smallpox. Their child, Willem Hendrik [14 Nov 1650 – 19 Mar 1702 Gregorian] would become on 08 July 1672 (Gregorian) stadholder of the Netherlands, conquer England as the champion of Protestantism, overthrow his father-in-law, and in February 1689 he and his wife (Protestant daughter of Catholic king James II of England) would be proclaimed England's king William III (who did not die of smallpox) and Queen Mary II [10 May 1662 – 07 Jan 1695 Gregorian], who died of smallpox. _ Prince William III, the Prince of Orange as a Child (1654) by Adriaen Hanneman. _ Mary II, Wife of Prince William III (1684) and William III, Prince of Orange and from 1689, King of England (1684), both by Caspar Netscher. ^ >1985 Spyros Vassiliou, Greek painter born in Galaxidi on 27 Apr 1902. �- Galaxidi (553x1575pix, 41kb) half the picture is featureless off-white sky. 1923 Benjamin �Williams Leader�, English painter born (full coverage) on 12 March 1841. 1878 George Clarkson Stanfield, British artist born on 01 May 1828.  Relative? of Clarkson Frederick Stanfield [03 Dec 1793 – 18 May 1867]? >1962 Florencio Maillo, Spanish “artist” apparently specialized in throwing trash at boards. �- A Prize Shorthorn in a Stable (754x900pix, 58kb) almost monochrome reddish brown _ Shorthorns, especially this one, have short legs. ^ 1790 Jan-Baptist van der Hulst, Belgian painter who died on 16 May 1862. — Grand Duchess Anna Pavlovna of Russia [18 Jan 1795 � 01 Mar 1865] (1837, 82x64cm; 600x465pix, 72kb _ ZOOM to 1984x1538pix, 2026kb) _ On 21 February 1816 she married Prince Willem VII of Orange [06 Dec 1792 � 17 Mar 1849], who became King Willem II of the Netherlands when his father Willem I [25 Aug 1772 – 12 Dec 1843] abdicated on 07 October 1840, and she became Queen Consort. — King Willem II of the Netherlands (1848, 97x80cm; 650x527pix, 62kb) _ This anecdotal painting shows Willem II seated in his art gallery in the Gothic Hall. In the background is a view of Kneuterdijk Palace. Displayed behind the king is a painting of a Madonna and Child with John the Baptist, thought at that time to have been by Rafael. On the ground lies a letter with the sad tidings that his second son Alexander [02 Aug 1818 � 20 Feb 1848] had died of tuberculosis on Madeira. 1732 Claude-Joseph Fraichot II, French painter who died in 1803. 1709 Giuseppe Zais, Italian painter who died on 29 December 1781. He may have served an apprenticeship in Belluno (near his place of birth) before moving, probably about 1725�1730, to Venice, where he was a landscape painter for nearly 50 years. The first and most important influence on his art was that of Marco Ricci, also from Belluno, who was in Venice from 1717 until his death in 1729. Ricci�s etchings, published in 1730, provided Zais with a useful source of inspiration. From them he derived the scenographic format of his landscapes, usually framed by clumps of trees into which villages and figures of peasants were inserted, painted in a thick impasto of rich color. The result is a pleasing, simplified style of great descriptive power. However, this attractive facility can also be seen as a limitation, for Zais never achieved Ricci�s dramatic effects. Zais�s contact with Francesco Zuccarelli in the early 1730s softened Ricci�s influence and introduced an increased refinement into his work, although sometimes at the risk of affectation.